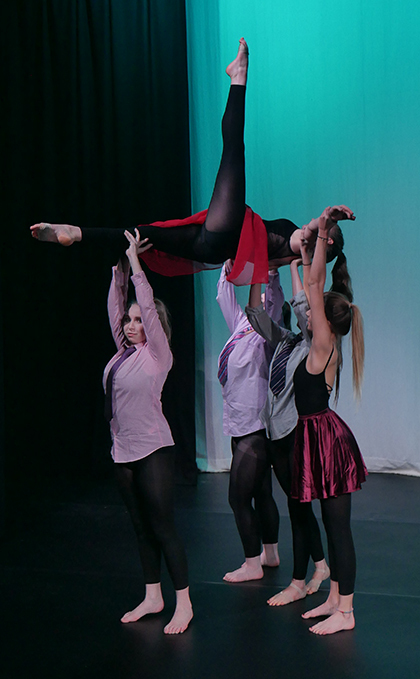 The first and second year A level students put on a show of 15 group and solo dances, all in a contemporary style. Their work was inspired by a choice of stimuli set by the exam board. The stimuli this year were wide and diverse. For first year students they were asked to choose between choreography based on Barbara Hepworth’s “Orpheus” sculpture or creating a dance based on the poem by Maya Angelou entitled “Caged Bird”. For second year students, they could choose to choreography a group dance that explored the characteristic features of the American Pop Art movement, the different stages of sleep, or the embodiment of the physical characteristics of one or more geographical bodies of water found on the earth’s surface.